Col. Gabriel’s combination of achievements is unique. His twenty-one-year tenure at the highest point of military music, Commander/Conductor of The United States Air Force Band, Symphony Orchestra and Singing sergeants of Washington, D.C. was the longest in that organization’s history. His military service began as an army infantryman in World War II, a combat machine gunner in the famed 29th Infantry Division, landing on a Normandy beach, receiving the Combat Infantryman Badge, two Bronze Star medals for battlefield bravery, and the French Croix de Guerre. He had a second career as professor and music department chair of George Mason University, and he is held in unsurpassed admiration as a guest conductor of community bands in all parts of America. 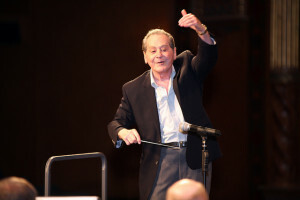 Gabriel is also unique in holding three degrees from Ithaca College: the Bachelor of Science and Master of Science in music education (1950, 1953), and the Honorary Doctor of Music (1989). Col. Gabriel was inducted into the National Band Association Hall of Fame of Distinguished Band Conductors, becoming the youngest person ever to have received this honor. He is also a Past President of the prestigious American Bandmasters Association. 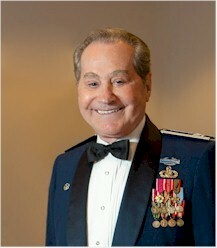 In 2008, the US Air Force Band dedicated the “Arnald D. Gabriel Hall” in his honor, and Bands of America inducted Col. Gabriel into its Hall of Fame. Col. Gabriel was named Music Director Emeritus of the McLean (VA) Orchestra for his outstanding leadership from 1986 to 2002. “The Band of the Nation’s Capital”, the 257th Army Band, appointed Col. Gabriel as “Conductor Emeritus, where he appears on a semi regular basis conducting concerts and work sessions in which he shares his vast experience and knowledge with the musicians of the band. In December 2012, the Midwest Clinic: An International Band and Orchestra Conference gave the unprecedented, first and only “Lifetime Achievement Award” to Col. Gabriel. 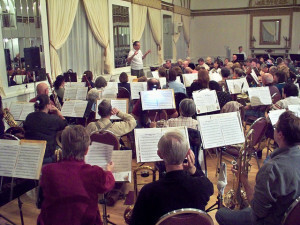 As a conductor, he has thrilled audiences in all fifty states and over fifty countries. He continues to appear as clinician at major state, regional, and university music festivals and guest conducts outstanding school, college, community, and military bands as well as orchestras around the world. On June, 6, 2014 Col. Gabriel conducted the D-Day 70th Memorial Wind Band commemorating the 70thAnniversary of the Battle of Normandy and the Liberation of France at the Normandy American Cemetery and Memorial. The Repasz Band is a non-profit 501(c)(3) organization; individuals in the Band, including officers and directors, are not paid for either rehearsals or performances. Donations from individuals to help defray the Band's operating expenses are gratefully accepted and are tax deductible in accordance with IRS regulations.